Posted on January 11, 2018 January 12, 2018 by admin1 Comment on “Why won’t my toddler eat? !” Three tips to establish positive feeding habits in your home. The most common type of referral I get is regarding feeding issues. One type of toddler feeding issue includes kids who generally present with a lot of defiant behaviour at mealtime, and whose parents tell me that they have no interest in eating. Parents will also tell me that mealtime is often stressful, overwhelming, and may end with the child throwing a tantrum. Before addressing issues related to “picky eaters” or oral sensitivity, it is essential that parents work on establishing positive habits around feeding. 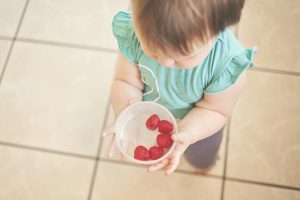 In this post, I discuss three basic strategies to develop healthy feeding habits with your toddlers. This typically applies to kids ages approximately 18 months to 3 years old. Mealtime Dynamics: Do you eat dinner together as a family? Is there a mealtime routine? Mealtime rituals are so important to develop healthy eating habits. While I appreciate that is is difficult to always have meals as a family, it is important that there is at least some routine as to how mealtime occurs. That is, mealtimes should have a clear beginning and end, take place at the same table in the home with no distractions (like TV, phones etc..), and that they are time to enjoy with mom, dad or grandma or whoever the child is eating with. One of my first recommendations I give to clients is to try and establish a mealtime schedule and a mealtime routine with one snack between each meal. Focus less on quantity, and trust your child. I often find that parents are too concerned about the quantity of the food their child is eating. As a mother, I can relate. However, (and you’ve probably heard this before) it is highly unlikely that a child will starve him or herself. Children will eat when they are hungry. Young children, unlike adults, have growth spurts. During those growth spurts your toddler may ask for more snacks and eat twice as much at mealtime. There will also be days (or weeks) when their growth slows down and they are not as hungry. If your child is an active toddler, is gaining enough weight (or not losing), and is having regular bowel movements then he or she is probably eating enough. Accept defiant behaviour, but set clear limits. It is important that parents do not agonize over a child’s eating behaviour during mealtime, and that they maintain mealtime a safe and relaxed environment to enjoy family time. I often tell parents to shift their focus to a sibling or to chat with their partner. If no one else is around, I ask them to try and practice mindful eating and focus on their own plate. When your child rejects the food by saying “NO” or “I don’t want it”, avoid asking them to try it again, or worse, bribing them with something like TV, phones, or candy. Gently acknowledge that you have heard them, and ask that they try something else on their plate. This takes time, but with consistent and predictable routine, it will hopefully work, and reduce defiant behaviour. These are a three starting points for establishing healthy mealtime routine. However, there are lots of other issues that impact children’s feeding habits. Feeding issues can be very stressful, and if not addressed, can get worse over time and may exhaust parents’ energy. If you are really struggling with your child, you may benefit from a comprehensive in-home feeding assessment with an Occupational Therapist. Contact us and we would be happy to help!